Ravenswood Winery Zinfandel Vintners Blend California 2008 ($8): The first wine I tasted in today's lineup was from renowned Zinfandel specialist Ravenswood. Vintners Blend is the winery’s value offering, made from carefully-selected sourced grapes. Aged in oak one year. Composition: 77% Zinfandel, 18% Petite Sirah, 5% Carignane. I opened the bottle and went through the usual tasting ritual: swirling, color and aroma evaluation, etc. When I swished this wine around in my mouth I was disappointed: I didn't seem to be getting anything. I finished my glass, popped in a cork, and forgot about it. It wasn't until the next day that I realized I should have opened the wine and let it aerate for an hour or so before tasting. I tried the same bottle again, allowing the wine to sit a while after removing the cork. To my amazement, the formerly innocuous wine had opened up in a massive way. It was transformed into a powerhouse of black cherry and raspberry with tantalizing spice/black pepper busy in the background. Delicious! This was a lesson to me to always give a wine (especially a red wine) time to aerate, opening up the aromas and bringing out the flavor. Rosenblum Cellars California Zinfandel Vintner’s Cuvée XXXI ($8): Another blend of carefully-selected sourced grapes, this wine is rich, medium in body, and extremely fruit-forward (lots and lots of blackberry). I liked the Rosenblum Zin almost as much as the Ravenswood, which is really saying something. Both these wines offer tremendous value. Both pair excellently with hearty meals, from BBQ to pizza to braises. Excellent wines both, which I plan to enjoy often in the future. I do wonder: if these $8 wines from Ravenswood and Rosenblum are so damn good, what are their higher-end offerings like? I can't wait to find out! Redwood Creek Lodi Zinfandel ($6): I’ve tried Redwood Creek’s Cabernet Sauvignon, which has a rep for being one of the better entries in the lonely world of inexpensive Cabs. I thought it was just fine for the money (about $7-8). So when I saw their Zin on the shelf, I decided to check it out. It was okay, and I suspect would pair well with just about any kind of food. I guess I’m drawn to big Zins, though, because after the Ravenswood and Rosenblum, this seemed way tame. Trader Joe’s Coastal Zinfandel 2008 ($4): I love Trader Joe’s, but thoroughly disliked this innocuous, slightly sour wine, which possessed no noticeable Zinfandel characteristics. The bottle labels held only two sentences about the wine, the first of which caused me to wonder whether Trader Joe's has begun out-sourcing writing tasks to Outer Mongolia: "Located in the beautiful valleys of the Central Coast, Trader Joe's presents this lush Zinfandel." So, then: Is Trader Joe's located on the Central Coast? In multiple locations? This past Wednesday I attended the Napa Valley Grapegrowers Association (NVGA) press conference, an annual event that offers an overview of the coming winegrape harvest. The morning fog was just starting to disappear from the Valley floor when I turned on to Conn Creek Road, and by the time I arrived at Beckstoffer Vineyards a few minutes later it was sunny. The press conference was held on a green expanse of lawn surrounded by Beckstoffer's famed Georges III vineyard, with beautifully-restored 1800s farm buildings in the distance—a particularly pastoral location. We’ve had an unusually cool summer here in wine country. The tomatoes and beans in my garden have been agonizingly slow to ripen—and of course it’s just the same for the grapes. A cool grape-growing season is worrisome for numerous reasons, including the potentially negative effect on crop quality, so I was anxious to hear what the experts had to say. In a nutshell, everyone seemed positive and upbeat. Yes, it’s been cool—but the growers have been using every tool and trick at their disposal to mitigate the weather. 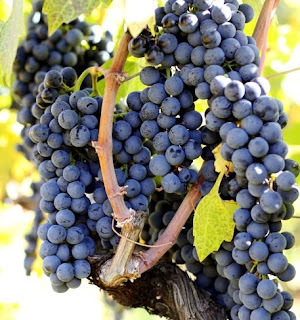 Just two examples: limiting water to the vines forces the grapes to ripen; judicious removal of leaves allows direct sunlight to touch and ripen the grapes. As it stands now, the grapes will be harvested about a week later than usual, but an uptick in heat during Indian Summer could reduce that time. 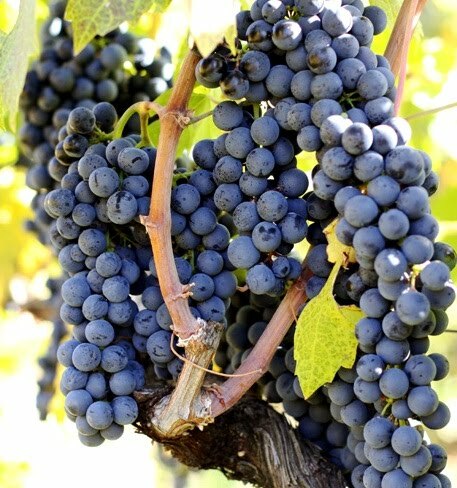 John Conover, the General Manager of Plumpjack Winery and CADE Winery, noted that it's "unfair to equate slower, cooler vintages to poor quality wine. Sometimes great wines come out of cool years.” To prove his point he’d brought along a few bottles of Plumpjack Reserve Cabernet Sauvignon from 2005 (another cool-vintage year). It’s a fabulous wine, incredibly well-structured and rich with plum, chocolate and spice. 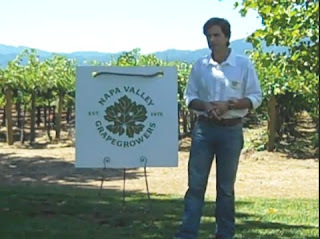 NAPA, Calif. (August 19, 2009) – Napa Valley Grapegrowers, an organization of those who produce the premier fruit from which some of the world’s finest wines are derived, held its annual press conference Wednesday, August 18, at Beckstoffer Vineyards in Rutherford, California to forecast the 2010 Napa Valley winegrape harvest and address ongoing concerns about the cooler-than-average temperatures thus far in the growing season. The harvest press conference featured a panel of grapegrowers and viticulturists, from various Napa Valley appellations. Topics included the potential impact of the cool growing season on the size and quality of this year’s crop, grape prices, labor supply, the European Grapevine Moth threat, and the effects of the economic downturn on grapegrowers. A much-published wine writer, Bob put out a message to his contacts and the bottles were soon rolling in. Instead of judging the wines in a clinical fashion, as he often does in formal tastings, he decided to take a different approach: “I wanted to taste in real settings and at different times of the day," he said. "I wanted to experience wines at all price points. 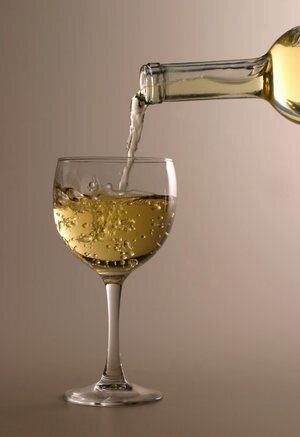 I wanted to try the wines just like someone would at home, in a restaurant, at a bar, beside the pool.” So, according to an article he wrote, “that meant Chardonnay for breakfast, lunch, dinner and dessert.” It also meant serving lots of Chardonnay to guests, and once he showed up at a party with 16 bottles of the stuff. Bob’s goal all along was to find the wines that best represented aspects of the Chardonnay ideal. An interesting aside: Bob’s original intention was to select an international group of Chardonnays, but the wines he received from Chile, Argentina, France, Australia, New Zealand, and South Africa didn’t make the cut. 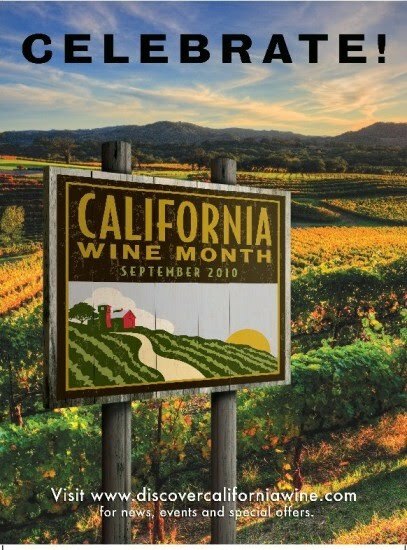 In the end he chose all California wines (from Alexander Valley, Carneros, Livermore, Mount Veeder, Napa Valley, Russian River Valley, Santa Cruz Mountains, and Santa Lucia Highlands). Fifteen Chards made the top-level “Killer California Chardonnay” list; and there were 10 Honorable Mentions. You can see the entire list, with notes, in Bob’s article, Killer California Chardonnays. Well, it's a rotten job, Bob, but I guess somebody's got to do it! Invite me when the Zins start flowing. Most mornings I get my exercise first thing. It's fun, and that hour flies by—thanks to an mp3 player loaded with podcasts geared to my interests. Among those interests, naturally enough, are wine and food. Feeding this habit has required me to sift through dozens of podcast series over the last few years. Some have been downright horrible; most were okay; a small number were very good; and a very few can be counted as great. Definitely a Great! This was the first pocast I ever got hooked on, maybe 2 years ago, and I continue to enjoy it to the max. Splendid Table is a fast-moving and entertaining 45-minute podcast of a weekly radio program. The secret behind its success is the host, an ebullient Lynne Rossetto Kasper (surely this always-upbeat woman is a secret grouch!). The program covers a lot of ground, interviewing everyone and anyone in the food & wine biz: cookbook authors, culinary historians, magazine editors, chefs, wine experts, restaurant owners… Without fail, every edition starts off with a lively segment featuring famed USA road travelers and eaters, Jane and Michael Stern, who fill us in on their latest mouth-watering discoveries somewhere in the hinterland. During the last third of the show regular folks call in and ask Lynne cooking questions, and no matter how obscure the query, she always seems to have the answer to hand. BTW, Lynne is author of The Splendid Table: Recipes from Emilia Romagna, The Heartland of Northern Italain Food. That book won the 1993 Cookbook of the Year award from the James Beard Foundation. She has also won two other Beard Foundation awards: Best National Radio Show (1998) and Best Radio Food Show (2008). 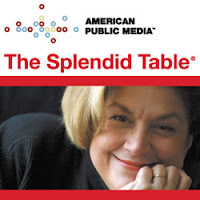 Visit The Splendid Table website, which is loaded with recipes, or learn how to subscribe to the podcast (it’s free). 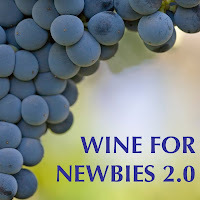 Halfway between Very Good and Great (IMHO), this series is for newbies, sure, but there's also a lot here for much more experienced wine aficionados. This 101-episode series was originally posted between 2005 and March of this year. It’s been a labor of love by Indiana attorney and college professor William L. Wilson. The podcasts average about 10 minutes. I like Wilson’s low-key, folksy style. He explains each topic clearly and simply, occasionally adding a brief personal take to illustrate a point. The podcasts start off covering the basics: explaining individual varietals and discussing such things as why it’s a good idea to keep a tasting journal. I knew most of what was contained in these early podcasts, but found them to be a good refresher course—and I did discover a few things I didn’t know. As they progress, the podcasts cover increasingly sophisticated topcs: the wines of Portugal, Hungary’s Tokaj, Matching Food & Wine, Blending Wines. One thing I really like is Wilson's consistent demystification of wine. Talking about wine critics, whom he considers useful in many ways, he nonetheless ends up pointing out that the only wine critic who ultimately matters when judging a wine is you. If Robert Parker gives that Cab a 100 score, but you think it's awful? Well, you're right. The Bottom Line: this is a terrific course for covering essential wine know-how. And it’s free! If you like it, you may want to purchase Wilson's Wine for Newbies iPhone app (it's only $1.99) so that all the info you need, including recommendations, is just a finger-poke away. You can download the podcasts individually here or via iTunes. I’ve just recently subscribed to this series, but so far it's firmly in the Very Good category and may well edge upward. It’s produced by Napa’s Goosecross Cellars—but, hey, don’t worry. No advertising, and they don't discuss themselves much. The podcasts are thoroughly professional, but also lively and interesting. 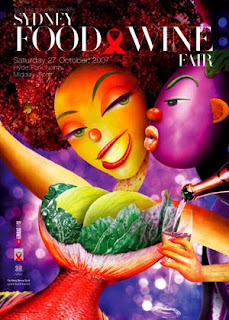 The focus is on all aspects of wine and food, with an emphasis on learning. 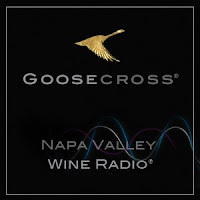 In fact, Goosecross employs a Wine Educator, Nancy Hawks Miller, who narrates some of the podcasts in a style that's down-to-earth but still possesses plenty of panache. The series, which began in 2006 and is still going strong, issues a new podcast about once a month. On average they're less than 15 minutes long (some longer, some shorter). Here are a few topics I'm looking forward to: Heritage Turkeys; History of Wine Words; To Oak or Not to Oak; Winemaking 101; Authentic Balsamic Vinegar; Italian Food of the Renaissance. You can subscribe to the Napa Valley Wine Radio podcast on their website (scroll to the bottom of the page to locate the iTunes button). I should add here that I don't know anyone at Goosecross, and I've never even tried their wines (although I'll probably rectify that omission soon). I just like their podcasts, plain and simple. 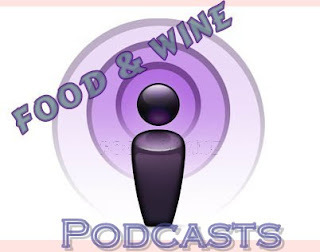 If you have suggestions for great food and/or wine podcasts, leave a comment. 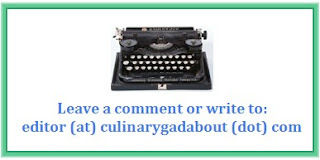 You can also write to me: editor (at) culinarygadabout (dot) com. Enjoy! Isn't this a great poster? Do Biodynamic Wines Just Taste Better? In case you missed the recent New York Times article entitled A Taste of Biodynamics, here's a point of view that might interest you. After admitting that he's far from a fervent biodynamic convert, author Will Lyons nonetheless acknowledges that "having tasted numerous wines made using some of the practical aspects of biodynamics, I have found they are marked with a purity, silkiness and concentration rarely found in other wines." He discusses an informal tasting he enjoyed in Bordeaux at Château Fonroque, sampling "wines made before and after biodynamic principles had been introduced, and the comparison was marked. The wines made under the new regime were lighter, cleaner and purer." 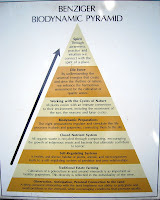 There's a lot more that's interesting, including a brief look at the original biodynamic principles promulgated by Rudolf Steiner back in 1924. 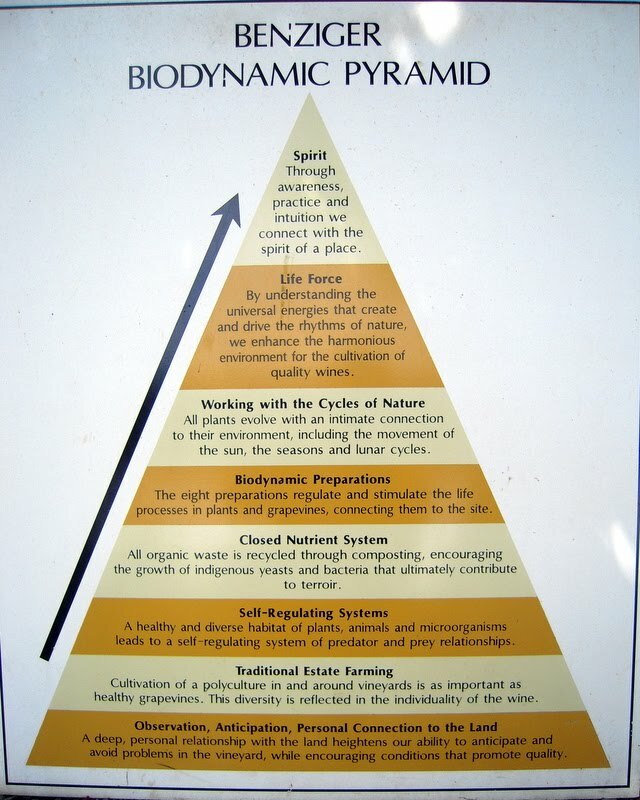 Thanks to Benziger Family Winery for the Biodynamic Pyramid graphic (click to increase size). Olive Oil Standards Update: Back in June I wrote a small piece about the US Department of Agriculture's new and revised standards for olive oil. It all boiled down to this sentence: "In other words, if it says Extra Virgin Olive Oil on the bottle, the contents must soon meet the scientifically verifiable criteria that defines Exra Virgin Olive Oil." Now it looks like a group of Cailfornia restauranteurs and chefs are suing olive oil distributors and retailers. Can you guess why? You got it! Apparently, a recent UC Davis study found that many olive oils on the market aren't what they claim to be...and that has caused a lot of anger among culinary professionals. According to an August 4 article in The Washington Post, the lawsuit--filed in Orange County--"seeks punitive damages, as well as reimbursement for profits made from alleged false marketing and advertising using the extra-virgin label...The lawsuit, which seeks class action status, targets 10 major olive oil brands, including Bertolli, Filippo Berio, Carapelli, Star, Colavita, Mezzetta, Pompeian, Rachael Ray, Mazolla and Safeway Select. It also names 10 major supermarket chains and big box stores that allegedly marketed substandard oil under the extra-virgin banner." Philippine Culinary Throwdown: Love to cook--especially Philippine cuisine? Then the upcoming Philippine culinary contest wants to know about you! Open to to residents of Northern California who are at least 18 years old, the contest's two divisions cover chefs both Professional (culinary training and/or have worked as a chef/cook in a restaurant ) and Amateur (possess a passion for cooking Filipino dishes but have not been gainfully employed as chef in restaurants). The San Francisco-based competition will be staged in two rounds: semi-finalists will be selected on August 15, and the final competition will be held on October 24. The contest contains numerous categories; the grand winner in each category will receive a round trip ticket to the Philippines and a tour to top culinary destinations. To learn more, send an email to pdotsf@aol.com, call 415-956-4060, or visit the contest's official web page. Michelin's Joined the Foodie Travel Biz: Michelin, known since early in the 20th century for its hotel and restaurant guides, has gone into the culinary travel business by offering food-themed vacation packages. Michelin Food & Travel will give foodies an insider's experience at Michelin-starred restaurants with private kitchen demonstrations, private food and wine tastings, and lots more. Starred hotels are also part of the game plan. The program is launching in France (in Provence, Côte d'Azur and Paris) and will gradually include Italy, England, other parts of Europe, and Asia. I downloaded a copy of the Côte d'Azur itinerary, and ooh la la! Dining at Ducasse's Louis XV Restaurant sounds good to me, as does discovering "what Chef Emmanuel does with artichoke hearts." The Monte Carlo Beach Hotel, Saint Paul de Vence's Le Mas de Pierre, dining at Les Moulins de Ramatuelle in Saint-Tropez...who wouldn't like that? If only I could afford it (prices start at $6,650). Oh, well. 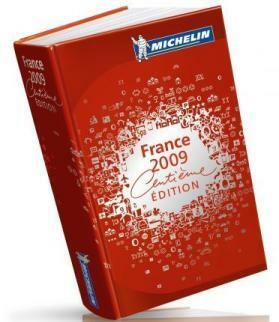 Read all about it at Michelin Food & Travel. 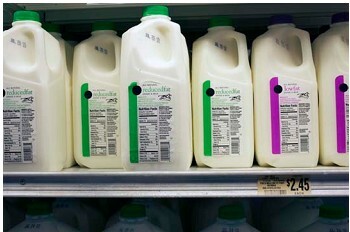 Shelf Life of Foods: A new study from ShelfLifeAdvice and Harris Interactive says that 76% of U.S. consumers mistakenly believe that certain foods are unsafe to eat after the "Sell By" date printed on the packaging has passed. The five products most often considered unsafe in that regard: milk (61% of respondents); cottage cheese (57%); mayonnaise (54%); yogurt (50%); and eggs (45%). However, according to Joe Regenstein, professor of Food Science at Cornell University and a member of the ShelfLifeAdvice Board of Advisors, “Food scientists agree that most foods, if stored properly, can be safely consumed for days or even weeks past the package date. The dates on food packages are very conservative; if the product was stored properly, it should last well beyond the date on the package.” For example, propertly-refrigerated milk will remain safe, nutritious and tasy for about a week after it's "sell-by" date. You can see comprehensive shelf life and storage information on hundreds of foods at ShelfLifeAdvice. offers storage and safety information about hundreds of foods. One thing that surprised me by browsing through the products was that canned food does not last forever (I've always assumed a can of something could last years); the average seems to be from 1-2 years.